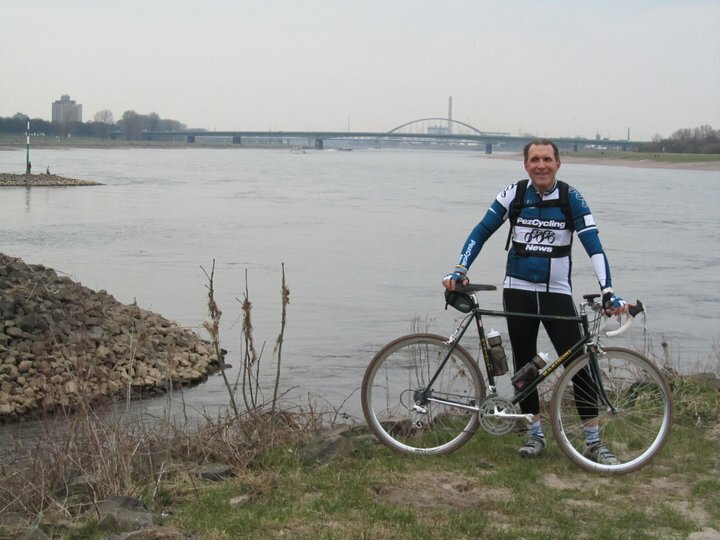 Travels with a Tin Donkey: Cycling the Mighty Erft: the Touring Season Begins! 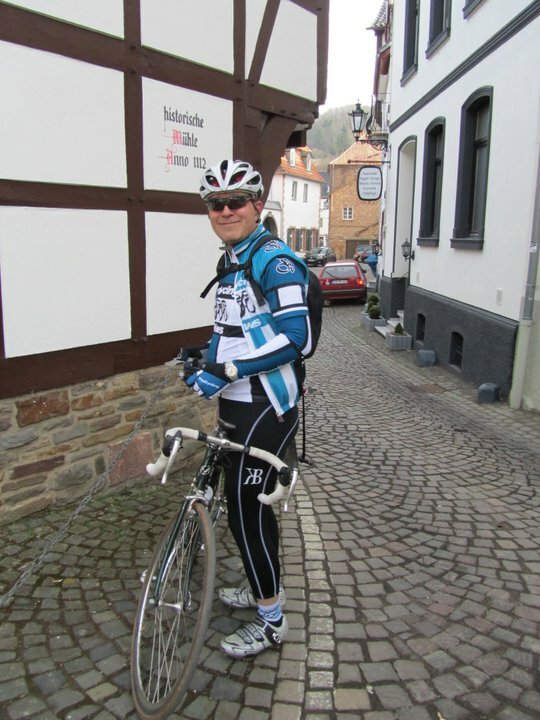 Cycling the Mighty Erft: the Touring Season Begins! Living as we do in this modern world of electronics, it always delights me that I can ride my bicycle, a century-old invention, over sometimes-cobbled roads to destinations rich in history and communicate through this blog with digital photos and GPS maps of my rides to an audience (small, but select, I flatter myself) as quickly as I can type. 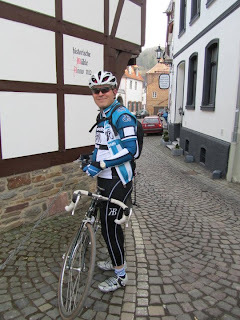 My most recent bike tour in Germany, which took place last Saturday, March 12, not only benefited from fine Spring weather but also the presence of my Facebook friend Nick, a British expat teaching near Bonn. We have communicated by e-mail since we both arrived in Germany around the same time last August but have never actually been able to meet. Two attempts–to meet in Essen for the bike fair and to meet in Bonn for the exhibition on Napoleon–fell apart due to illness (and believe me, colds and flus seem to last forever here) but things finally came together for a day-long bike ride. While looking at the very excellent Nordrhein-Westfalen (NRW) bicycle map, I discovered a reasonable-length bike route accessible to both of us and which would take us about 120 km to the Rhine at Neuss, very close to Düsseldorf, meaning access to the rail system so that Nick could easily get back to Siegburg and I could get back to my neighbourhood S-Bahn station in less than 20 minutes. That was the plan, but it was nearly derailed by Deutsche Bahn, as my train to Cologne arrived five minutes late. With only a seven minute connection to meet Nick on the platform for the next train, I had to move pretty fast and made it just as the train pulled in. The regional train was not very crowded, so there was plenty of space for the bikes and we sat and got acquainted. No lack of signs here! Disembarking at Nettersheim, I saw a sign for the Urft River, which is not be to confused with the Erft, which we were planning to follow! Getting our gear together took a few minutes but we soon we riding off on quite country roads with no traffic. There was a bit of up-and-down for a while but it was great to have the fresh Spring air and I could feel my legs getting back into that cycling groove. Nick’s usual rides in the Bergische Land involve non-stop brutal climbing, so I think he was pretty relieved that today’s ride, once we reached the source of the Erft, would be mainly downhill. A few minor wrong turns, but then we had a fast descent into Holzmühlheim, where the Erft begins as a spring coming out of a rock wall, 10 kms from our starting point. Time for some photos, and the chance to get the bikes a bit muddy as we walked through the little park that led us to the spring. There was also an old gristmill stone nearby, and once we were back on the road, we passed an old mill on the Erft. We continued riding the quiet roads but then the route began to pitch up, quite severely at one point, as the bike ride led us off of main roads. Reaching the crest of a hill, we saw Bad Münstereifel spread across the river ahead of us, and with 20 kms in our legs, it was time for a coffee in the most scenic village in the southernmost part of NRW. We entered the town through an impressive gate, passing a restored mill (now a hotel) dating back to 1112. The town was founded in 830 AD and has had a significance as a religious centre and a pilgrimage destination, with a number of monasteries (hence “Münster”) having been built. The wall around the town is mainly intact, as we entered through one gate and left through another one. The last religious order, the controversial Legion of Christ, left the town in 2008. The “Bad” part of the name indicates it is a spa resort. This begin in 1926 and the town added “Bad” to its name in 1967. Today it is a major regional tourist destination, judging from the cafes, including one owned by the town’s most famous current resident, Heino, the he’s-an-acquired-taste German folksinger. 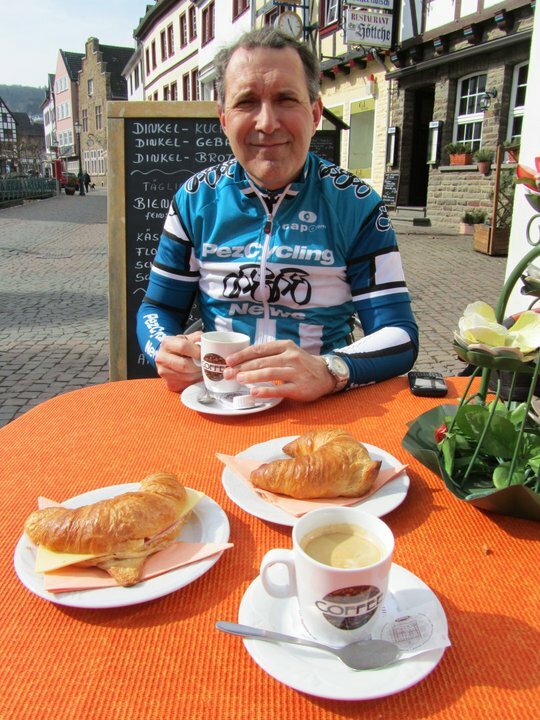 The river runs directly through the centre of town and we propped our bikes up against a stone wall and enjoyed our coffee and croissants. Old men walking by gave the bikes the once-over, and I tweaked Nick that they spent more time looking at my classic steel bike than at his magnificent Serotta Ottrott. A bit further on, we came upon a bright red British telephone booth and a mailbox, both of which Nick tells me are becoming rarities, so more photos there. The next town we came to, at the 30 km mark, was Euskirchen. It was here that the bike route signs began to fail us, and then the asphalt failed us as we ended up on unpaved paths following the banks of the Erft. Nick’s research had told me that the river had been quite wide but through its use for irrigation it had become the rather ditch-like feature it is today. Euskirchen, which was founded in the 14th Century and has 55,000 inhabitants, was not very attractive and the traffic seemed quite bad on this Saturday at noon. The town is twinned with Kutztown, in the US Pennsylvania Dutch country. As we had only covered 30 kms in the first three hours, we determined to push on a bit or else the ride would take us way past the fall of darkness. Although we were moving quickly, we were hampered by the poor quality of the bike route in many places. We passed Weilerswist, Erftstadt and Kerpen without seeing very much and then the route along the river was really bad through Bergheim and Bedburg. In Bergheim, we rode around the impressive Schloss Paffendorf, a 16th Century water-castle and in our attempt to get through Bedburg on the wrong road, we passed Schloss Bedburg, which has scaffolding around it. It was a school for the nobility from 1842 until 1922 and thereafter served other purposes but after all these years the foundations were shot and there was no economic choice but to demolish this fine building, rebuilt in the 16th Century, as the 12 Million Euro cost of renovation was not forthcoming. Bedburg was also the scene of considerable violence between Catholics and Protestants immediately prior to the 30 Years’ War, and the site of the trial of the so-called “Bedburg Werewolf,” a farmer accused of murdering thirteen women and children. It is not clear whether the farmer actually committed these crimes, but his barbaric execution was meant to give troublemakers pause. Kaster: cake and coffee soon! On the other hand, rolling through the old gate at Kaster brought us to our first long stop after Bad Münstereifel, as we headed down the pedestrian zone to a bakery. We revived ourselves with some latte macchiatos and German high-sugar energy pastries and launched into the last stretch of the trip. After Grevenbroich (Km 110) we saw no further signs for the route and although we were heading for Neuss we were on a main road. However, a sign did eventually show up and using Nick’s GPS and our somewhat errant navigational sense, we managed to find the banks of the Erft again for the final push towards the Rhine. Passing a mill, we gained speed and fairly flew to the end of the route, although it appeared we ended up on the wrong bank of the Erft at the confluence. No matter: we had a fine view of the barges passing on the Rhine and the end of the official. A short ride took us into Neuss, which must be the only town in Germany where the Bahnhof is not prominently signposted. Nick, asking for directions, used his extensive German by first asking a passerby, in English, whether he spoke English. Nonetheless, we were pointed out the right way and headed north, yet again going through a pedestrian zone, this one with streetcar tracks in it. It seemed to be taking a long time so I thought I would ask a passing girl just to be sure. After I said “Excuse me,” I realized she had earbuds in but she looked directly at me and when I said “Excuse me” again, she looked again and kept moving. Nick laughed. We reached the train station as dusk was approaching and as our trains were about to arrive we parted, saving the beer for another occasion. I was pretty tired as this had raised my mileage for the entire year from 58 kms to 188 kms, but luckily although I had felt some cramping coming on during the ride, I did not get the screaming muscle seizures while sleeping that night! In spite of the bad sections of the path, it was a great day out and reminded me of just how much I love to ride in Germany. I think next time we should find a route that is a bit shorter and look around some more, or just concentrate on the more interesting sections of a bike route. I think I will also map the course on my GPS beforehand so that we do not go around in circles quite so much!